Olympic stacking bins are injection molded from polypropylene base resins in natural gray (NAT), static dissipative blue Benstat (BAS), or black conductive Bentron (CAS). 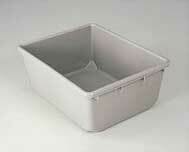 All sizes have an open hopper front for easy access to contents and a slot on the back for use on bin holders bars. 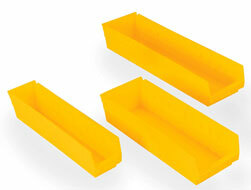 These yellow bins are available in two sizes for efficient handling and transfer. Stackable design maximizes vertical storage efficiency. Dividers are available separately. Ruggedly constructed, perfect for storing large, bulky items.